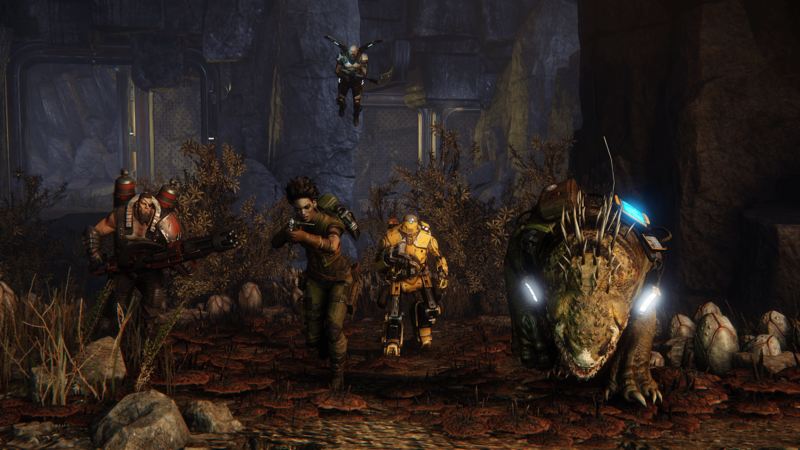 Evolve, Turtle Rock’s first next-gen entry, launched earlier this week. I picked it up on Xbox One and have sunk about 5 hours into it so far. This is by no means a comprehensive review of the game, but more of what to expect when you get your hands on it for the first time. Evolve boasts a 4 vs 1 asymmetrical multiplayer. That term is popping up more and more in the industry with titles like Dying Light, but what does it really mean? To make it simple, four people play on a cooperative team while another player gets control of an enemy character. In Evolve, this translates to four hunters, each with a different class (Assault, Medic, Trapper, and Support) up against a single monster (Goliath, Kraken, or Wraith). The goal of the game differs depending on which side you play. 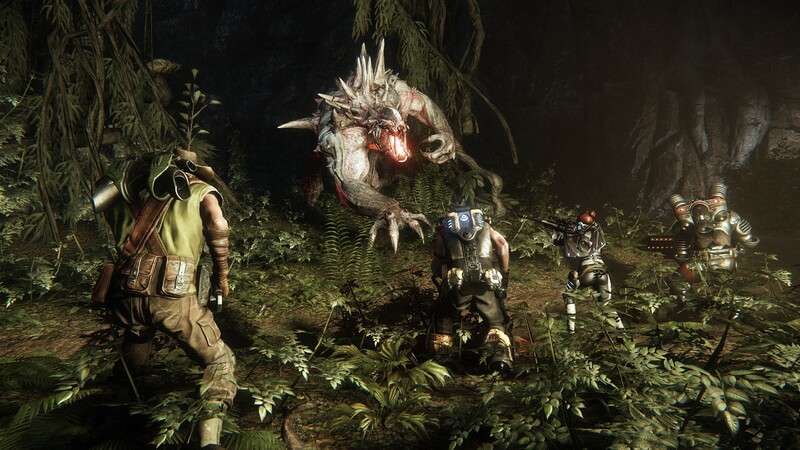 Hunters track and try to kill the monster as quickly as possible while the monster’s goal is to feed, evolve, and kill all four hunters or destroy an objective. So far, the balance between both sides is pretty even. Turtle Rock’s last report states that hunters win 51% of the time and monsters 49%. Developers have been tweaking the game ever since the public alpha and beta to get the balance just right. Hunters excel in working together and have many tools to trap, weaken, or slow down the monster. Monsters fight back with brute strength and special attacks that can dish out massive damage. Whichever side you are on (the game lets you decide which role you would like to play most) you’re assured to have some fun as long as you play smart. Evolve has a high learning curve, especially for monsters, but included videos and playable tutorials provide some useful tips. The replay value is extra high thanks to a dynamic “campaign” mode where players compete in various game types through 5 different maps, combined with the fact that there are 3 playable characters, each with unique equipment for each of the four classes. Overall, this is a game worth picking up. I look forward to a full breakdown after the weekend. Have you played Evolve yet? What did you think? Keep the conversation going in the comments. Space Time Taco is your go to site for Gaming & More.